What is marginal energy, or fuel on the margin? Fuel on the margin, when talking about the electric grid, refers to which fuel will be used to generate the next additional kilowatt of power that is required. Imagine that your house is in a steady state, using the same amount of power, with a steady mix of fuel being used to generate that power. When you turn on a light, which one of those fuels will increase in generation to meet that demand? This is the fuel on the margin, and is largely (but not exclusively) a function of how much it costs to turn that fuel into electricity. This price takes into account the time of day, cost of the fuel, amount of extra power needed, technical constraints, and rules and regulations. Which fuel is typically on the margin in the U.S.? Currently, for most of the U.S., natural gas is the fuel most likely to be on the margin. Soon, it will be the fuel on the margin for the entire U.S. This will likely remain the case until energy storage becomes widespread. The U.S. is divided into Regional Transmission Organizations and Independent System Operators, which are non-profit organizations that manage the grid in different regions of the country. 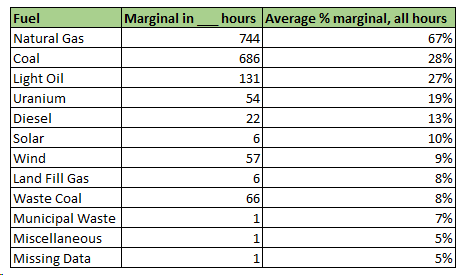 I've taken a look at data from some of the largest to see which fuel is on the margin for each. These regions cover most of the U.S. population (the southeast and most of the west are excluded as these markets are still vertically integrated, meaning that each utility is self-regulated and there's no central source of data). MISO covers most of the midwest and a few southern states, and operates 175 GW of capacity. "CC" stands for combined cycle and refers to power plants which burn natural gas and use multiple heat engines to improve plant efficiency. These plants can ramp faster than coal, but not as fast as traditional natural gas "peaker" plants. Combining the percentages for CC and gas, natural gas was the fuel on the margin 64.7% of the time, compared to 50.4% of time time for coal, the next-most-marginal fuel (The numbers can sum to more than 100% because multiple fuels can be on the margin at the same time -- like two gas stations selling gas for the same price). PJM covers 13 states on the east coast, serves 65 million customers, and has 166 GW of total capacity. 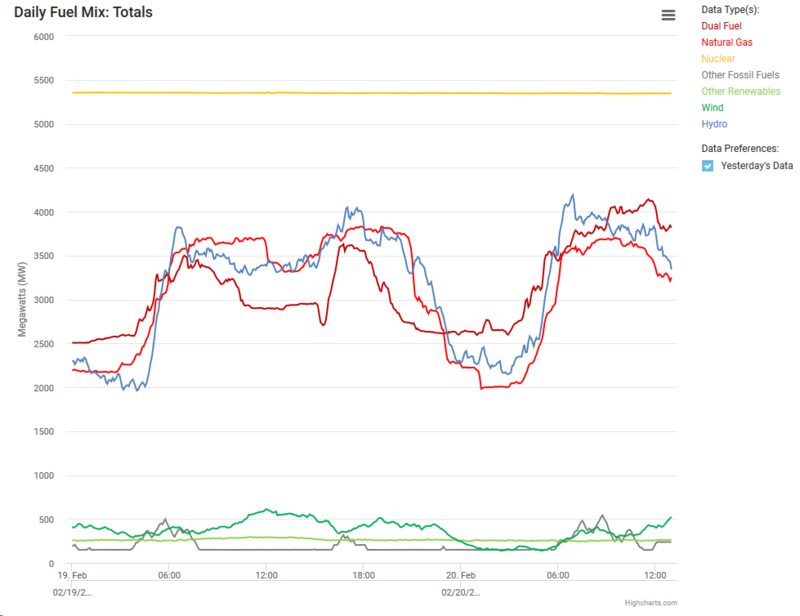 PJM operates a 5-minute market, meaning that the fuel on the margin can switch as often as every five minutes. 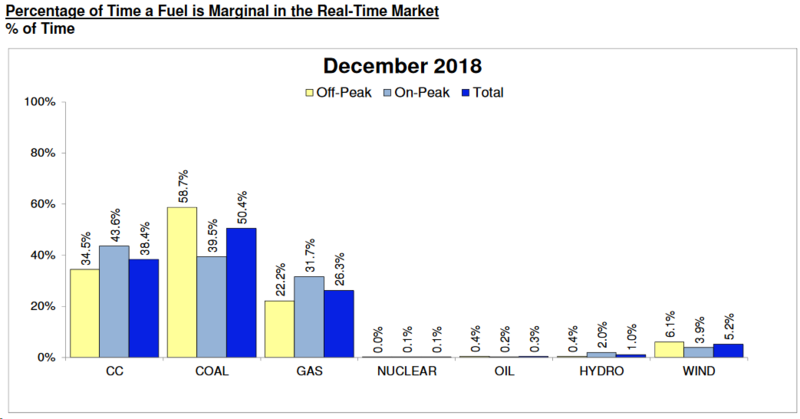 From the table, we see that natural gas was marginal within 744 hours of the month, and was the marginal fuel 67% of the time, more than twice as often as coal, the next most marginal fuel. The Southwest Power Pool (SPP) covers a column of states between Texas and the Canadian border, and operates 85 GW of capacity. 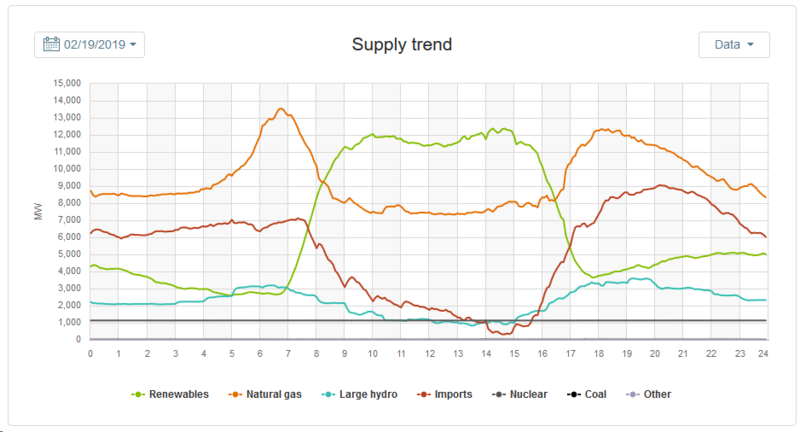 Here it's clear that while the trends for natural gas and coal roughly match, coal dominates the mix by volume. Overall though, natural gas is more variable, meaning that as coal plants close, natural gas will take pole position as the marginal fuel. ERCOT covers most of Texas and manages 76 GW of capacity. From this it seems clear that natural gas ("Gas-CC" and "Gas") is essentially the fuel on the margin. CAISO covers most of California and manages 60 GW of capacity. Coal (near the bottom) is a flat line. 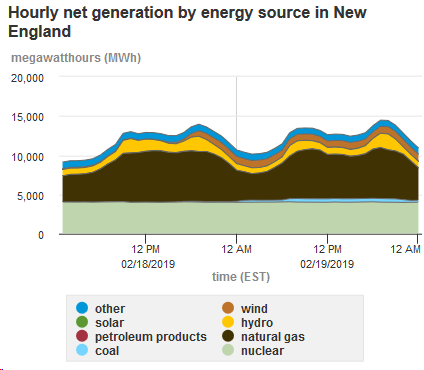 When renewables (mostly solar) come on- or off-line with the sunshine, natural gas ramps up and down, meaning it is the marginal fuel. NYISO covers New York state and manages 39 GW of capacity. The story here is more interesting due to the large amounts of hydro electricity available, and the large number of dual fuel power plants which can burn either natural gas or diesel. So while it may look like a three-way tie, we can lump dual fuel plants with natural gas plants, since diesel is more expensive than natural gas. This means that natural gas is also the marginal fuel in New York. ISO-NE covers six north-east states, and operates 32 GW of capacity. From the chart it's clear that natural gas is the most variable fuel -- the most likely to increase or decrease output over time. This is another way to say that it is the marginal fuel. Let's consider a very small population that uses 10 MWh of energy per year. 9 MWh comes from hydropower, 1 MWh comes from burning coal. Let's say the population consists of 10 individuals, each of who is using 1 MWh of energy. Hydropower is a resource that is currently nearly 100% utilized. Now, somebody from the population reduces his energy use to zero. Thus causes a reduction of 1 MWh in the power generation. It doesn't make sense to reduce hydropower, so the coal use will be reduced to zero. Who of the 10 users of energy is the guilty one using the coal? Let's analyze. If energy user #1 reduces his energy use to zero, coal won't be needed anymore. Thus, we can argue that energy user #1 is the guilty one using coal. Now, if energy user #2 reduces energy use to zero, the same argument applies. Thus, energy user #2 is the guilty one. However, the same argument applies to energy user #3, #4, ..., and #10. Thus, everyone is guilty of using coal! Thus, it could be argued that all energy is marginal energy, and here, marginal energy is coal. Marginal energy means the power plant that will be the first to be shut off when energy use reduces, and or will be the first to be turned on from reserve when energy use increases. In some areas, plentiful natural gas has reduced coal use to practically zero (e.g. in US), so can it be argued that marginal energy in the US is natural gas and not coal? It doesn't make sense to burn coal if there's enough natural gas. Thus, if there's even a single coal plant in use in US, the marginal energy there is coal as well. When the last coal plant is turned off, marginal energy is natural gas. Now, if you calculate emissions using the assumption that everyone is guilty of using coal, you get 10 MWh worth of emissions, which is clearly incorrect. This is corrected in the analysis by assigning negative -9 MWh worth of emissions to hydropower facility owners, meaning total emissions are 10 MWh - 9 MWh = 1 MWh. Not the answer you're looking for? Browse other questions tagged energy energy-use coal or ask your own question. What are the Energy Return on Investment (EROI) values like for biogas?